Sandra Harrison’s scooter with all of its add-ons. If you happen to be driving to Emory in the early morning, you might see a pink glow among the tail lights of your fellow commuters. If so, you are probably catching a glimpse of Sandra Harrison (Business and Administration), as she rides the most tricked-out scooter imaginable to work. Sandra developed a love of scooters in her youth and became serious about them when the price of gas exploded to $4 a gallon. Her scooter gets about 70 miles per gallon (although those numbers are a tad lower with the addition of the trike kit) and holds a little less than 4 gallons of gas. 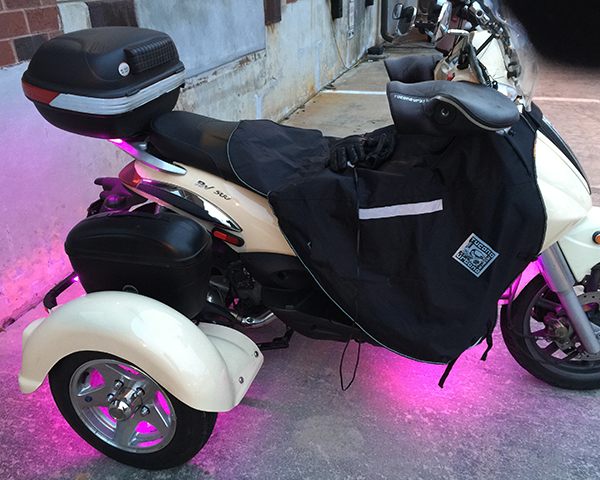 She purchased her scooter at a Vespa dealership in Atlanta, which also does most of the custom work. “I like the freedom of being in the open and riding the scooter to work is very relaxing,” said Sandra. She is a member of a scooter club called the Wild Knights, which coordinates summertime scooter rides in the North Georgia mountains and also does monthly dinners where they ride the streets together as a club. They even have biker jackets. Kelly Bray on his bike inside 1762. 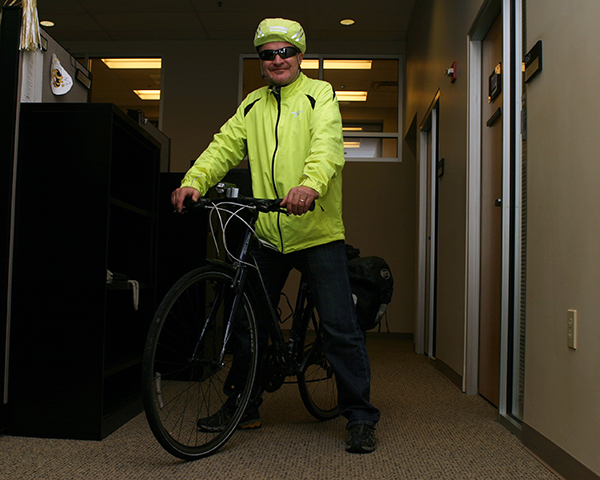 Sandra is not the only LITSer who utilizes alternative means to get to work. In fact, 1762 seems to be a haven for riders. Kim Comstock (Business and Administration) and Julie Leon (Middleware and Web) ride scooters, John Anderson, Derrick Kelly, Bernard Sanders, and Winfred Snead (all of Network Engineering) ride motorcycles, and Kelly Bray (Middleware and Web) and Ron Foust (Business and Administration) ride bicycles. According to a study by the US Public Interest Research Group, a national trend for less automotive use has been underway since reaching a per capita peak in 2004. By 2011, the average American was driving 6 percent fewer miles than in 2004. The US Department of Transportation funds a website that offers statistics about the benefits of walking and biking to work. So, next time you are filling up your vehicle or paying your Emory parking fee, think about Sandra and her happily glowing, tricked-out scooter. This entry was posted in Staff Bytes and tagged Business and Administration, Data Engineering, Middleware and Web, sustainability, wellness. Bookmark the permalink. Post a comment or leave a trackback: Trackback URL.